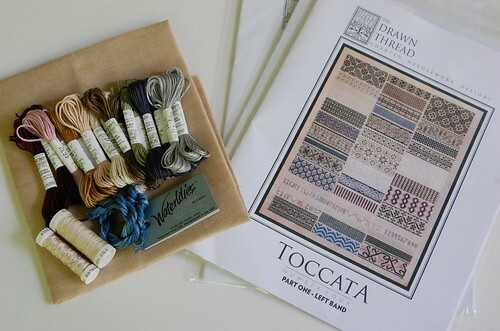 This is The Drawn Thread's "Toccata Four." I fell in love with it after seeing Lynn's Beautiful finish. You must check out her whole album. Her stitching is just amazing!! It works! Beautiful fabric and threads for an intrigating project. Does every blog has this kingsize option? I like it! Yes, those pictures are big! I love the big pictures. They are very clear. The fabric and thread are wonderful looking. I can't wait to see your progress on the Toccata. It is so beautiful. gorgeous pictures Nicole!! how'd you do it? 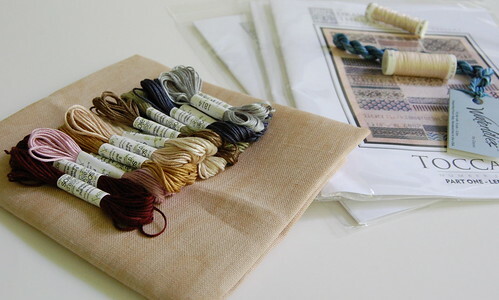 I love that first picture you've taken of the linen and threads. It's so exciting to see supplies all fresh and new, and ready to be worked with. It's such a gorgeous piece!!! Definitely on my list to stitch at some point. Beautiful piece. I just love the wonderful photos you take of your fabrics and silk all perfectly lined up. I swear mine never look quite that good when I start! LOL. Can't wait to see the progress on this one. I can't wait to see your start on this one Nicole. I really love that design! Everything looks gorgeous! I wish I could pick those silks up right off the page! It's crazy but those pics make my mouth water. I must be part moth. lol. 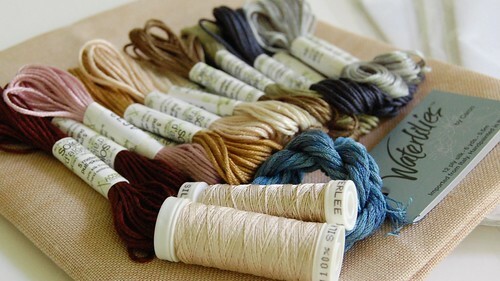 Gorgeous thread colors. It will be so beautiful. Can't wait to see your start. Love the new project, Nicole! I think DTs are timeless... and Lynn always does gorgeous work!